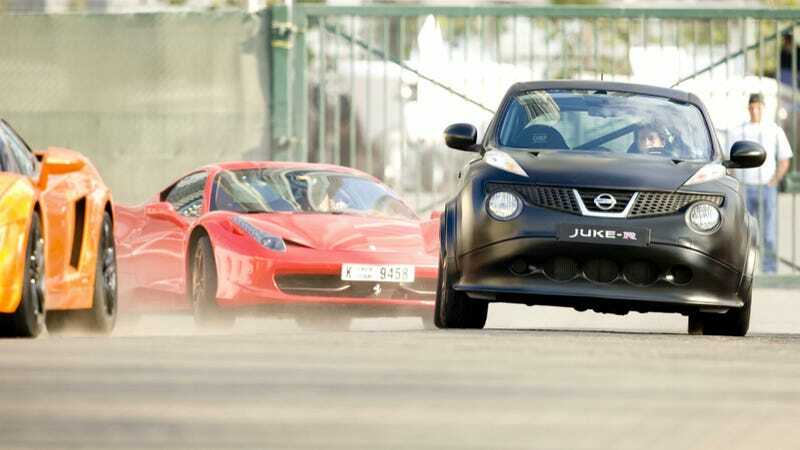 Nissan initially said they wouldn't divulge the price of the Nissan Juke R set to go into limited production this year, but a source tells us around $600,000 is the sweet spot for most markets. That's roughly the equivalent of 30 base Juke Rs. The pricing for the 545 hp Godzilla-toad Juke R, if our source is right, matches with what we'd heard earlier from Skiddmark about it costing "Several GT-Rs" to buy one. A price tag of $600,000 (roughly 450K Euros) is definitely equivalent to "several" of the roughly $100K sports cars. All that scratch gets you the custom RML-built hybrid, which involves the company buying both a Nissan Juke and a GT-R and then tearing them down to form the unholy parts alliance. According to our friends at autoplus.fr, the total production run will be limited to no more than 20-25 vehicles. Could it be? Operators are standing by.